He can even crochet without looking! Jonah Larson is an 11-year-old Wisconsin kid with an unlikely gift: crocheting. 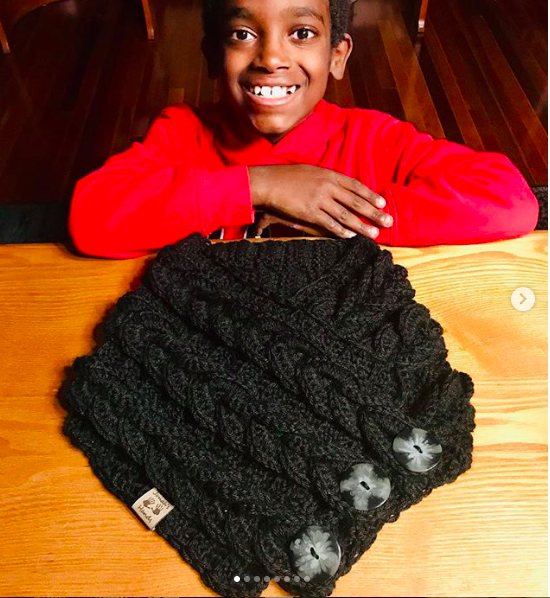 The crocheting prodigy taught himself the skill at the age of five when his aunt gave his mother, Jennifer, a box of crafts. Jonah, amazed by the shininess of the hook, turned on a Youtube tutorial and began his quest to crocheting. Now, he is a social media phenom and crochet extraordinaire. The kid can even crochet without looking at his hands! Jonah began his journey by making scarves, mittens, and blankets for himself, family members, and neighbors. His mother, Jennifer, made an Instagram account, Jonah’s Hands, so he could show off his skills. The sixth-grader now has more than 46,000 Instagram followers and over 2,500 orders. He even had to temporarily stop taking new requests! “I don’t want to overwhelm him, plus he likes to make things on his own terms,” said his mom when asked about the surplus of orders they receive. Crocheting, it turns out, is more than a hobby. Larson’s always been a smart child. He even skipped a grade because of his high performance on an IQ test. Boredom and distractions, however, led to behavioral problems in his fifth-grade class. His teacher encouraged him to bring his crochet tools to class so he could practice after his work was done. Jonah is also a humanitarian. He regularly donates to the Ethiopian orphanage where he was adopted from as an infant.